Let's dig into Wednesday night's Blues loss, shall we? Another 2-0 lead lost in blown point, including goal scored against in final minute; poor call against in second cost St. Louis crucial goal. ST. LOUIS -- Where has this script been written before? Stop if you've heard this before: Blues open the game looking like world beaters, Blues gain the lead, Blues sit back on lead, lead disappears, victory disappears. There have been disjointed losses, for sure, but welcome to the 2018-19 St. Louis Blues, who built up another two-goal lead in a game, only to see it slip away with a goal against in the final minute and the goalie pulled, which led to an eventual 3-2 loss in a shootout to Ken Hitchcock's Edmonton Oilers on Wednesday at Enterprise Center. 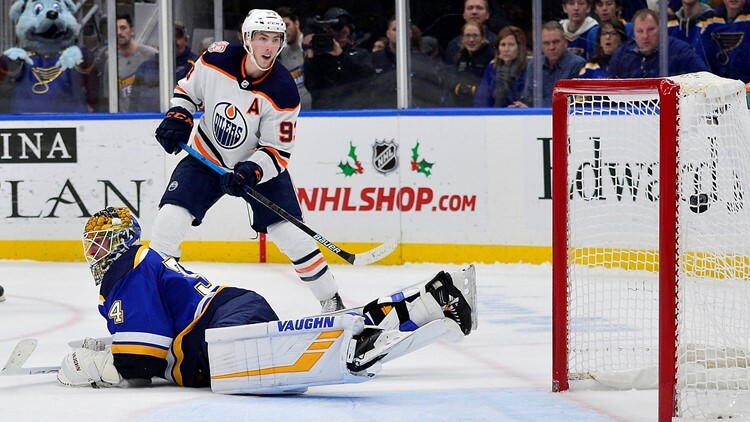 The Blues (9-13-4), were dominant in the opening 20 minutes, they outshot the Oilers (14-12-2) 15-5 and got goals from Ivan Barbashev and Brayden Schenn. But ... somehow, someway, the mindset becomes: sit back, hang on, hold on tight, and don't slip. That hasn't worked in ... ever. And Edmonton came out and poured 17 shots in the second period on Jake Allen, who was terrific in making 34 saves through regulation and in overtime, and Ryan Nugent-Hopkins got a second-period goal before Oscar Klefbom tied the game with 55.2 seconds left in regulation. "It happens when you sit back and play defense as soon as you get the lead," Schenn said. "We sat back as soon as we were up 2-0 the whole night, let them come at us and eventually, they're going to tie the game, which they did." Who does this happen? How has this become an epidemic in this room and players consistently admit to it in postgame interviews? "I'm not sure," Schenn said. Blues interim coach Craig Berube summed it up. "It's just the mindset," Berube said. "We're a fragile group I guess and guys are trying to hang on to a lead instead of making it 3-0. That's got to be more of our mindset. We should have come out in that second period and pushed the pace right away on them and tried to make it 3-0." But there may be a bit of defense for the Blues in this one. Not that they're absolved of blame for allowing the Oilers back into the game and actually sitting back, but this was not a particularly good night for officials Justin St. Pierre and Chris Rooney, especially St. Pierre. St. Pierre egregiously blew a call 6 minutes 55 seconds into the second period when the Blues should have had a goal off the stick of Zach Sanford that would have made it a 3-1 game. Sanford scored from the slot after Oilers goalie Cam Talbot was knocked to the ice by Vladimir Tarasenko, but Tarasenko, who was at the top of the blue paint trying to cut through the crease, got help from Oilers defenseman Matt Benning, who turned, saw Tarasenko coming, threw an elbow and shoulder into Tarasenko causing the goalie contact. But St. Pierre, with a clear view from the right corner, instead blew the whistle, waved off the goal and called Tarasenko for goaltender interference, sending the 16,551 in attendance into a delirium towards the officials, who didn't get any better as the game went on. Berube wanted to challenge the call, but it's a non-reviewable play since there was no goal to be reviewed once the penalty was called and Sanford touched the puck. "The ref had his arm up for a penalty on Vladi, interference with the goalie, so when Sanford shot the puck in they blew the whistle," Berube said. "And you can't challenge that, obviously, so nothing we can do. Berube got an explanation from Rooney, not St. Pierre, and wanted to have his say after seeing the replay. "Yeah, he was pushed," Berube said, who obviously let both officials know it. And the explanation Berube got? "Nothing," he said. "They're not going to say anything. They made the call, they can't reverse it. It is a big swing. But …"
The "but" is the Blues had other opportunities to cash in, but Talbot, who made 28 saves, was solid. He made saves on Ryan O'Reilly twice breaking in alone and one in particular on Sanford late in the game with the Blues trying to make it a 3-1 game. Oskar Sundqvist, who set up Barbashev for the first goal, had one in the slot staring at an empty cage go wide of the net on a backhand. "I tried to go same spot I went earlier on him," Sanford said of his chance on Talbot. "I beat him earlier under the arm. It just trickled out the wrong way." What was troublesome is that the Blues once again failed to properly defend a 6-on-5. When Edmonton gained the zone, the Blues lost the puck battle too easily. Then as the Oilers got the puck to the point for Klembom's one-timer, the Blues had five guys sucked in too deep, and the shot got through a screen past Allen. Tarasenko shied away from a shot block. "We've got to block that shot, that's the biggest thing," Berube said. "We've got to block that shot. Yeah. "[Tarasenko] could be out further, he could get out there a little quicker and get in the shooting lane and do a better job there, for sure." Allen had no chance with all the layers of bodies in front of him, but felt he could have gotten a better read. "I saw the big windup, I knew he was going far side so I tried to push over there," Allen said. "I just didn't get a good enough read on it. I should have tried to get a better read on it." The Blues were able to kill off a Schenn penalty in overtime and do a good job there, but in the shootout, after Tyler Bozak scored, Allen couldn't stop Ryan Nugent-Hopkins and McDavid, and Talbot was able to make saves on Tarasenko and Schenn. Another game, another lost point. It's the fourth time the Blues did not win when taking a 2-0 lead. They lost 5-4 in overtime Oct. 6 here against Chicago, lost 5-4 in overtime at Winnipeg on Oct. 22, lost 7-4 against Columbus here on Oct. 25 and on Wednesday. "The game never should have gotten to overtime. It's unfortunate it did," Allen said. "Again, we did a great job in overtime to battle to kill that one off. The PP, the 4-on-3, some good looks, big blocks there. It shouldn't have gotten to overtime. We had a good first period, we have to keep up the effort up a little more." "We got caught in a three-quarter ice game there, just stopped making plays," Berube said. "When you stop making plays, you get the puck out, they just pound it back in and they're coming at us. That's their game too so we fed into them in the second. "... I thought the third was not bad. I thought it was a pretty good period. We had some opportunities to close that game out. We didn't finish. ... We'll look at the film and talk about it and go over it again and keep banging away at it."